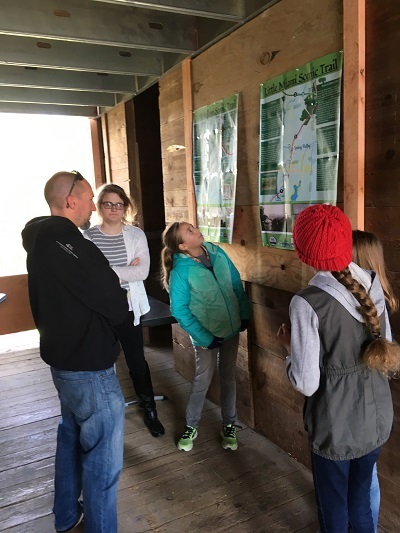 McKinney Middle School seventh-graders culminated their months-long “Into the Wild” project with a presentation and public exhibition on October 26 in the historic barn at Agraria, the Arthur Morgan Institute for Community Solutions’ farm and center for regenerative agriculture. Much of the students’ research and inspiration came from a three-day camping trip with faculty and parents down the Little Miami bike trail. The students biked 53 miles, camped out for two nights, researched local history, and canoed and waded in the Little Miami River to study macroinvertebrates. Kate Lohmeyer, health and physical education teacher for grades 7-12, was part of the teacher leadership team for the interdisciplinary project. All the participating teachers were “in some way, avid participants in the outdoors, either focused on exercise or just being in nature,” said Lohmeyer. “We thought it would be great to share that with the kids. It turned into this wonderful experience.” Under the direction of science teacher Rebecca Eastman, students also studied macroinvertebrates in Jacoby Creek on Agraria. Holding the exhibition night in Agraria’s barn “was a great way to culminate the experience for our students,” said Lohmeyer. Help support education at Agraria by donating to Community Solutions on Giving Tuesday, November 28!